Do you love to bake? Or are you hopeless in the kitchen but still want the aromas and the praise for delivering festive Fall treats? Whatever level of kitchen prowess you possess, we’ve got you covered. First, for the baking from scratch folks, here are some links to recipes you can make to capture all the taste sensations associated with the Fall season. Tea Cakes, scones, pies and more! This blog from foods52 features 10 tea cakes that are perfect for the Fall season. Pictured at left is their Chocolate Pumpkin Loaf. Try it with a China Yunnan tea like our Cangyuan organic black. In a pinch to find recipes for your next tea party? We have the answer! TeaTime Magazine lists lots of delicious recipes on their site. For ideas on table settings and menu offerings, click here to see some of TeaTime Magazines’s lovely suggestions. All the recipes above are fabulous for people who have the time and skill to bake but not everyone falls into this category. Some of us are up front about this and others …. Are you the type who makes desserts from a mix and then hides the box in the trash and tells everyone you made it from scratch? No judgement here! As long as there are tasty treats I won’t complain as to how they were made. To help you with your sneak-ery, we have some scrumptious new cake and scone mixes to thrill all your family and friends. Add milk, oil and eggs to these mixes and in approximately 45 minutes you’ll be enjoying fresh baked and scrumptious cakes with your coffee or tea. Add heavy cream to these scone mixes and in about 20 minutes your kitchen will be filled with lovely aromas and your tastebuds will be jumping for joy. 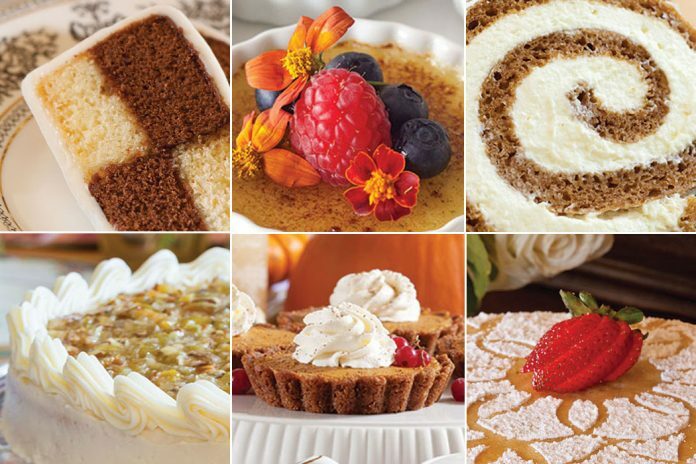 Whichever way you like to create desserts for your loved ones, we hope some of the recipes and mixes above will help you for your next Fall party. Good food, great tea, the beautiful serenity of the Fall season and your loved ones around you… sounds like the ingredients for a perfect recipe.